Hands up if you’ve lived in Sydney your entire life and never made the embarrassingly short commute to the Blue Mountains. Yes, we’re looking at you. Well, it turns out that there’s a helluva lot of feasting, drinking and (obviously) sightseeing to do in our UNESCO heritage-listed backyard. No biggie. Fire up the car and dust off that 90s pop playlist—we feel a road trip coming on. When it comes to escaping Sydney (and winter's incessant chill factor) and embracing the country charm that is the Blue Mountains, you’ll want to park yourself at Fairmont Resort. It feels like a ski lodge, with rooms that are comfy AF, staff that are almost too accommodating (not a thing) and more restaurants than we knew what to do with. Plus, they’re currently doing a ridic reno on their spa facilities, and you better believe that we’ll be first in line when that bad boy re-opens. Your feed (get it?) will be peak #instagoals with the high tea at Fairmont. 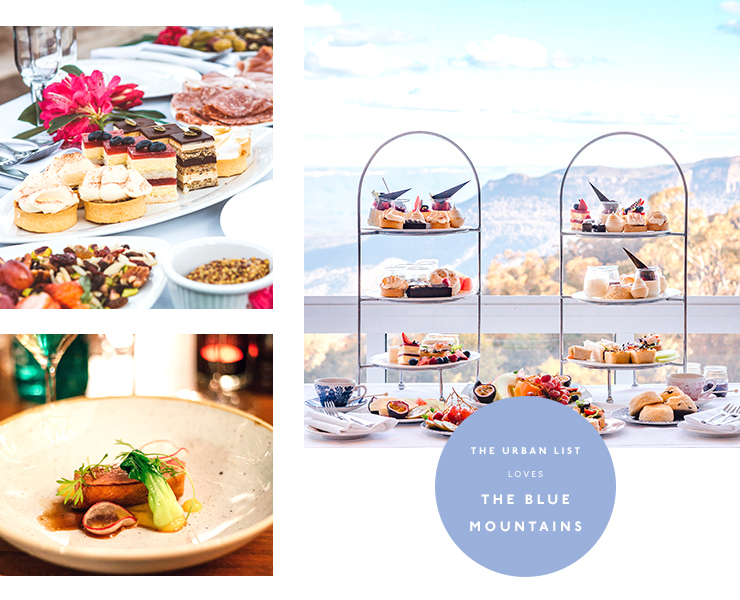 Piled high with all the high tea staples—think miniature sandwiches, lemon meringue tarts and fruit galore—you’ll scoff the lot while looking out over the mountains. We feel relaxed just thinking about it. Whether you’re popping in for lunch or settling in for dinner, park yourself fireside at Embers in Fairmont Resort. As soon as you walk into the restaurant, you’ll be handed a marshmallow to toast in the fire and a wine menu (because priorities) before you even glance at the food. Our hot tip? Toast your ‘mallow, order a glass of wine, then hit up the beef brisket. It’s their speciality for a reason. When you wake up with one thing in mind (coffee, duh), head for Anonymous Café. The beans are by Campos, and because they love themselves a speciality brew, there’s also a rotating roster of single origin beans. On the food front, it’s all about seasonal locally grown produce and house-made bread, pickles and relishes. You know what to do. It doesn’t get any more Australian than a freshly baked meat pie and these guys are known for theirs. Hand-crafted and baked in-house errrry day, you’d be crazy to skip these as you cruise through Blackheath. Once you’ve settled into the hotel, be sure to hit up the Sublime cocktail lounge, where the wood fire is always roaring and the cocktails are mint. We had the espresso martini and backed it up with the strawberry daiquiri-style winner—don’t you dare judge us. Leura Garage is nailing the ultimate foodie trifecta—great food, a huge range of booze and true blue Aussie charm. We know the last one isn’t strictly food-related, but it couldn’t hurt, right? We suggest you head here for the (frankly) massive wine list, but stay for the stone-baked pizza. Okay so bear with us on this one—if you’ve never been on a Segway tour then wake up to yourself. They’re damn fun. Opt for an all-terrain tour, like the ones by Segway Tours Blue Mountains, it means more fun and less chance of falling off the damn thing. For reals though, this is the best (and laziest) way to see the sights as you cruise around the mountains. Sold? We thought so. 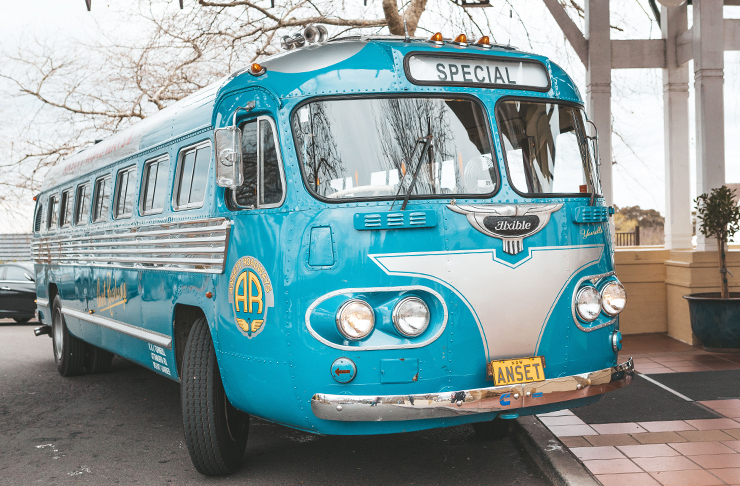 If you’ve got a big crew, then booking one of the retro Ansett coaches is a must. We recommend you take some Champers along for the ride and really live it up. When it comes to sightseeing, we urge you to avoid the damn tourist traps and take it off road with Mark from Blue Mountain Guides. Not only does Mark bring along a hot choc (with marshmallows and Tim Tams, obvs), he’s grown up in The Mountains and knows all of the secret spots. He’s also been known to keep the good times going well after your tour should have wrapped up, and his sense of humour is honestly top notch. We know you’re a sucker for a market, and guys, this one really puts the farmer in, well, farmers’ market. Our mate Mark told us that Blackheath was a must—the views are epic and this is honestly The Mountains at its finest. Locally-sourced produce, meats and crafts are king here, so take some cash and spend up big. Heading a little further up the coast. This is our guide to Byron Bay.